Once it’s built, TriMet’s Milwaukie Light Rail bridge over the Willamette River will be the first in the country to carry only light rail and people on bikes and foot (no cars). What will the actual bike and pedestrian facilities look like? TriMet is currently working out design details with their new architect on the project, Donald MacDonald. 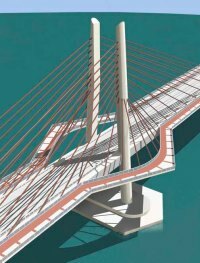 At a recent bridge design meeting, MacDonald unveiled some interesting drawings of what the new bridge might look like. 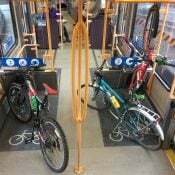 Also, TriMet’s bridge team offered details on the project to the City’s Bicycle Advisory Committee last month. Jeff Jahn of PortlandArt.net was at a recent design meeting and has covered the design talks closely. He says MacDonald has been touting the bridge’s bike and ped facilities as possibly being some of the best in the world. 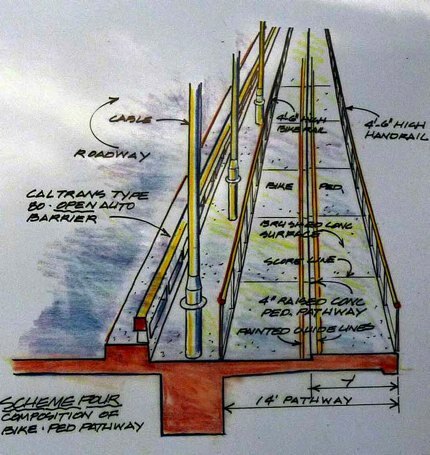 Jahn was kind enough to send over two more drawings of the bike/ped facilities by MacDonald. In the drawings (below), you’ll note that he has the path at 14 feet wide, evenly split between bike and ped traffic. For comparison, the Hawthorne — which some consider the busiest bike bridge in the country — is only 10.5 feet wide. MacDonald’s drawings also show an understanding of the importance of separating bike and pedestrian traffic (something that is an ongoing problem for the Hawthorne Bridge). In one “scheme” he has the ped path raised up four inches. In the other, he uses a different surface treatment to visually separate the lanes. In each scheme, MacDonald has the bike/ped facility separated from the transit lane with a multi-foot buffer, cables, and two guard rails. If I had to choose, my preference would be for not having a raised platform for the walking area. I think it could cause people on bikes to crash and it would make it more difficult to use the full 14-feet when no people are present. It’s also important to keep in mind that a seven foot wide bikeway would allow two people to ride comfortably side-by-side. 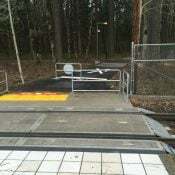 To set design parameters for the bike/ped facility, TriMet staffers said they did a demand analysis led by Metro, with help from City of Portland Bike Cooordinator Roger Geller. They looked at three different demand scenarios and mode splits with a thought to match Portland’s aspirational plans for bike use (Climate Action Plan says 20% mode share for bikes by 2030) and reductions in transportation emissions (down 50% by 2030). The Hawthorne Bridge currently has about 8,000 bike trips per day and that jibes with TriMet’s mid-range estimate of 8,300 trips a day for their new bridge. 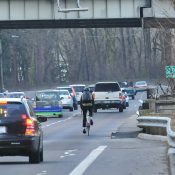 The Bicycle Advisory Committee hoped for more than 14 feet, citing the congestion problems on the Hawthorne which is just a few feet narrower. But, after realizing that’s as wide as TriMet would go, the committee members decided to write a letter in support of 14 feet. Friday, July 24, Noon-1 p.m. Note: Please RSVP directly to AIA Portland if you plan to attend. RSVP online here. Looks great to me although, being a bit afraid of heights, the flare-out in the middle might be a little creepy. On the other hand, it’s hard to knock a guy named Donald McDonald. I agree the raised sidewalk for pedestrians is a bad idea. 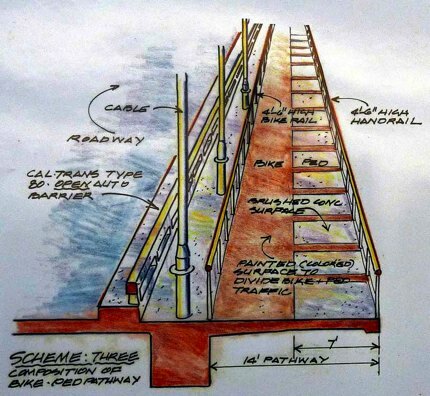 I like the design for bike/ped separation on the level platform. The space between the bike rail and the transit lanes (where the cables attach) seems like a waste of space that could be used for pedestrians if the walkway was instead on the other side of the bike lane. But then pedestrians wouldn’t get the good views. What is up with the funny bike/ped platform bump-out arch around the towers? the bump-out arch could be cool if done right, i’m concerned that the bike paths need to maintain some consistency and possibly get wider around those turns otherwise we may be in for some accidents. i’m excited to bike over this bridge. any word if this will be connected to the riverfront on either/both sides? It would be nice to have the center-span arches allow some distance from the traffic . . . but people will want to stop and enjoy the spot, they had best factor that in and create more width so it does not become a choke-point. Don’t care how cool it looks, just make it work. I tend to agree with you about preferring a non-raised platform, though the clear separation between cyclist & pedestrian that would impose would be a big plus. Still, I think it would be a more comfortable ride without it, and eliminate the possibility of pedestrians stumbling off the platform. I love the way the paths jutt out around the towers. I could easily see that becoming one of my favorite spots in Portland. Just for clarification this bridge will also carry bus lines 9, 17 and 19, which currently travel on the Ross Island Bridge. Here are some photos of bridges I’ve taken in Europe that have separated bike and ped facilities. Just sharing them to share what these types of places look like when built. I think the grade separated pedestrian section is likely to cause problems with just a 14′ wide path for a few reasons. First, the handrail on the inside of the bike lane will force a reduction in the usable width of the lane. Second, despite advisory signs galore, some bike riders do not cross Portland bridges on the recommended side of the bridge. A constrained 7′ wide bike lane will pose problems for head-on bike users. Maybe bike-compatible lane “bumps” would help define the lanes while allowing safety and flexibility on the bridge. Before you publish drawings like this, Jonathan, you ought be sure that their schemes are structurally feasible, otherwise people may be misled into unsupportable enthusiasm for them. I too was at that meeting, and observed that McDonald has no comprehension of the structural exigencies of the proposed bridge, which has reached a high level of technical design by very competent structural engineers. The same deal went down when you stoked enthusiasm for the “wave-frame” design by Miguel Roseales, which was impossible to build because of its grossly excessive weight. Also, I remind you of your promotion of relocating the old Sauvie Island bridge, which also was infeasible for several aspects of structural engineering: impossible to build foundations; seismic inferiority; difference between structural requirements of motor bridges and pedestrian/bicycle bridges. Head up to Multnomah County Library, Main Branch, and read “Elastic Arch Bridges” by McCullough and Thayer. When you have mastered that, let me know, for you will be competent to promote designs of any bridge you desire. Engineers are not our servants. They are much smarter than we are in their chosen fields. No lay person, and especially no architect, has the ability to play with their designs. Criticize, certainly; redesign, no way. Know your limits: with respect to bridges you are causing many more problems than you are solving. And now I am off to Mount Tabor to ride the fixie around the race course. I don’t like the idea of a separate grade for pedestrians vs. bikes. I do think a surface treatment could be effective in keeping the two types of traffic separated if the bike side is smooth and the pedestrian side is textured such that it’s less pleasant to ride on. That way in case of an emergency a cyclist can safely move over to the pedestrian side without crashing, but all things being equal cyclists will prefer to ride in the bike area. Think about a road that is half bricks/cobbles vs. half smooth asphalt. Jim, I don’t understand your post. So, since we’re not bridge engineers, we should have not say? Engineering follows design after all. You first design something, then engineer it to suit a need. Btw, I like the idea of grade separation. With a short curb your pedals won’t bite it if you get too close, and with color variation it’s unlikely to cause too much fuss. Just like a bike lane next to a sidewalk – how many people actually run into the curb? A separated grade on what amounts to a MUP, or legally a sidewalk, may not be ADA compliant. It could havoc with the elderly, blind, and lead to nasty wheelchair problems. Oh, and please color the concrete itself, dye or staining, rather than add a slippery or allegedly slip proof paint to the surface. WHEN the inevitable accident occurs it will take a while for EMS to get to you. Should they allow EMS to use the bridge? I think so within weight limits. You seem to say this with such conviction. Curiously, the City of Portland’s Bridge Engineer, David O’Longlaigh, came to very different conclusions. The bridge relocation project didn’t happen because of election-year politics, not because of technical challenges. Grade separation works well in the European countries whose bike/ped treatments have inspired this design. People are quick to identify worst-case hypotheticals, which is understandable, but the experience from these countries suggest they work. And I strongly disagree with Jonathan Maus about the appropriateness of bikes in the ped space. Bikes should not be in the ped space at all. Such use defeats the purpose of the separation in the first place. The success of separation relies on the certainty of separation, not separation when it’s convenient. Important distinction, even (or maybe especially) at 2am. Why does Tri-Met have the last word on bike path width…wtf? I ride full time and much of that is commuting to work. When commuting to work I prefer bike zones where I can obtain a good speed and have excellent transitions to other bike zones. The bridge pictured in this article, with its odd bump-out does not build my confidence that this bridge is being designed to move traffic, but to serve tourists. Why aren’t bump-outs put on car only bridges, for folks to get out and enjoy the view? Because it’s not safe? Because bridges are for traffic? Why doesn’t the Max ride on a bump-out so the passengers get a better view? I need to get to work, just like the folks on I-5. This bridge’s looks, at least as proposed, beat the *crap* out of the nondescript-at-best and ugly-at-worst CRC proposals. And all for Vancouver doctor-pilots??? good design should consider how people will actually use a facility. Not how you would like them to be used in a hypothetical world. A design that is concerned with moving bike and pedestrian traffic efficiently will take this phenomena into consideration and provide a space at the center of the span that is outside the traffic so that when people inevitably stop to enjoy the view, they don’t impede traffic. Psyclist #19 — I think it’s not particularly safe for motorists to stop on bridges, though I’m sure many would welcome a place to turn out, get out of their cars, and enjoy the view. Cyclists and pedestrians are much better able to stop without getting in anybody else’s way, especially when there is a design feature that provides a natural place for doing so. But if it doesn’t meet your needs, by all means avoid using it. The rest of us will enjoy it all the more. “world’s top ped/cycling bridge” – hardly. To have the world’s top ped/cycling bridge, the bike and ped portions should be completely separate, with a physical barrier to discourage pedestrians from walking into the bike space, and to legally separate the two areas (sidewalk and roadway). Also, 7′ for bikes isn’t going to cut it for this bridge. Once it’s built, it’ll see massive traffic. It needs 9′, plus another foot or two shy distance to the railings on either side. It’s potentially a good bridge design, but it needs some improvements to be considered the world’s best. Why the ‘bump out’ as people are referring to it, that is part of this bridges design? I didn’t go to the presentation, but I wish I could (maybe the next one), because I’d like to hear an engineers explanation for it. I’m guessing there’s a number of reasons for using it. Expense is probably a key reason. the bump out allows the support towers to span a width necessary to support only the MAX. A wider road bed would probably require a stronger structure than required with use of the bump out. Personally, the bump out seems exciting to me, and I don’t think it looks too bad. Maybe the shape could be changed somewhat to a gentle curve or something else some people would find more pleasing. To me though, it looks pretty good…practical and functional too. I think the “bump out” is a cool, defining feature. It goes without saying that the curvature of it will be designed for bike speeds. Keep in mind, it’s at the crest of the bridge, so only Lance Armstrong will be going more than 5 or 10 mph. As for why TriMet gets to decide width….it’s because they’re paying for it. By the way, 28′ of ped/bike space (two 14′ paths) is far and away the most space on any bridge yet. Thanks for the heads up for the next presentation. Jim Lee (#11) is 1000% correct. 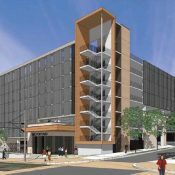 I am sick of seeing architectural renderings based in a fantasy world. That is the first step in guaranteeing that you get a ‘tram’ project with horrendous cost overruns. I’ll give two very specific examples that personify the antithesis of what you stated with regard to bridges. Gustave Eiffel, was a bridge designer first and foremost. I am not saying that the public should not have a say, quite the contrary. But if the architect drives the process, with public and politician approval; and engineering coming last, you are begging for a boondoggle. As far as the pathway is concerned, 2/3 width should be dedicated to bicycles and 1/3 to pedestrians; and I am in favor of curbing to protect the pedestrians. The flare out, is not practical for through traffic. The bridge should have a scenic overlook though. I think having separate bike and ped facilities is a MUST for any new construction. I was on the eastbank esplanade yesterday with a preschool group and I could see that the esplanade, designed to be shared, is now dangerous for pedestrians. I am both a pedestrian (65%) and cyclist (35%). As a cyclist, I don’t want pedestrians to wander into the bike area, and as a pedestrian, I sure don’t want a biker come up quickly behind me and have my startle reflex throw me into his path. I’d like a barrier, 2 to 3 ft. high, separating the bikes and the walkers. The raised walkway (low rolled curb type) is a very common and effective manner of soft verticel separation for facilities in Europe. I have used them frequently as a ped and bicyclist – and on some of the bridges Greg’s photos show. As for the ADA issue…the use of a raised edge and colour for separation should aid in keeping persons with disabilities (curbed edge/ texture esp. for blind pedestrians) from entering the fast lane [bike / roller blades]. The key to ADA is provinding a direct and accessible route and the above design does that with the walkway. Thanks for avoiding grade about 5% and the need for level landings. Too bad there are not more frequent resting areas for elderly peds – flip up benches flush with the railings, etc. My other thoughts: I concur with other posts that the blowed outsection could be a congestion issue – esp. if the view is nice…perhaps this can be widened (to function as a belvedier – sp); how about keeping the walkway section to 6′ and making the bikeway 8’…due to operational issues dealing with climbing lane conflicts with slow family bike trailers vs. solo cyclists – I assume the bike traffic flow will be one way; the addition of a ‘tall’ hard barrier between the lanes would effectily narrow both lanes due to adding the issue of continuious ‘shy’ distance of 1.5′ on each side – not a good idea with such a narrow facility with high projected volumes. As for expierence with the bike ped overcrossing of I-80 (Berkeley)…it has a raised soft separation too…though it could work a bit better if it had been treated visually better through the use of color.